DETROIT, Michigan, October 14, 2011 (ENS) – General Motors is poised to manufacture its first all-electric vehicle since the EV1 was discontinued in 2002. Chevrolet will produce the Spark EV, an electric version of the petrol-powered Spark mini-car, set to roll out in 2013, the company announced in Detroit on Wednesday. The Spark EV will be available in limited quantities in select global markets and U.S. markets, including California, Chevrolet confirmed. “The Spark EV offers customers living in urban areas who have predictable driving patterns or short commutes an all-electric option,” said Jim Federico, global vehicle chief engineer for electric vehicles at Chevrolet. “It complements Chevrolet’s growing range of electrified vehicles, including the Volt extended-range EV and the 2013 Malibu Eco with eAssist technology,” he said. eAssist technology improves fuel economy by approximately 25 percent. Last year, the first Chevrolet Volt extended-range electric vehicle rolled off an assembly line near Detroit, combining electric power and a range-extending gasoline engine. The Volt and the Malibu are part of Chevrolet’s current global electrification strategy to reduce petroleum use and vehicle emissions. The company’s current electrication strategy is an attempt to retake the lead in this sector of the industry that GM forfeited when its EV1 program came to a controversial end. The EV1 was an electric car produced and leased by GM from 1996 to 1999. It was the first mass-produced and purpose-designed electric vehicle of the modern era from a major automaker, and the first GM car designed as an electric vehicle. Although customer reaction to the EV1 was positive, GM believed that electric cars occupied an unprofitable niche of the market, and ending up repossessing and crushing all their electric cars, over the protests of owners. Today’s re-entry into the electric car market follows the Chevrolet’s introduction of electric vehicle demonstration fleets in Shanghai (Sail EV), Korea (Cruze EV) and India (Beat EV). Feedback from drivers of these electric vehicles is being incorporated into the new Spark EV. “The Spark EV is another step in Chevrolet’s plan to provide customers with a variety of electrification solutions to address the lifestyle and transportation needs of people around the world,” he said. 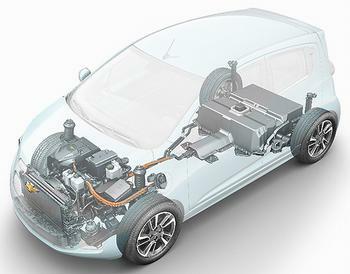 A123 Systems will supply the advanced nanophosphate lithium-ion battery packs that will power the Spark EV. Nanophosphate technology shortens charge time and increases the usable amount of the battery’s charge. Details on specific markets, range, quantities and pricing for the Spark EV will be announced closer to the roll-out date, Federico said. Chevrolet also offers gas-friendly solutions, including the Cruze Eco and the Volt. Cruze Eco offers 42 mpg on the highway while Volt offers 35 miles of electric, gasoline-free driving and an additional 344 miles of extended gasoline range, according to U.S. EPA estimates. This year, Chevrolet is celebrating its 100th anniversary. The company was created in 1911 by auto pioneer and industrialist William C. Durant and Swiss-born race car driver Louis Chevrolet.